An investigation is underway today into the mysterious death of a well-known and much-loved member of the team at The Plough Shepreth. Liv “Fishy” Goujon was discovered dead this morning at 8:00am in mysterious circumstances by Plough Landlord, Nick Davis. Speculation and suspicion surrounds this incident and staff at the Plough are struggling to come to terms with their loss. 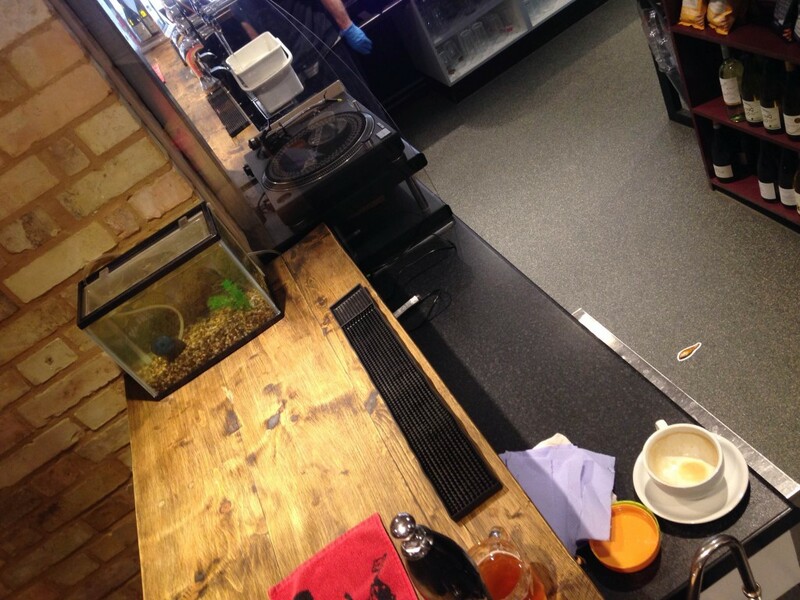 “It’s absolutely devastating” said Front-Of-House Supervisor, Kate Woodland. “Liv was a valued member of the team and the circumstances of her death make it all even more difficult to cope with”. 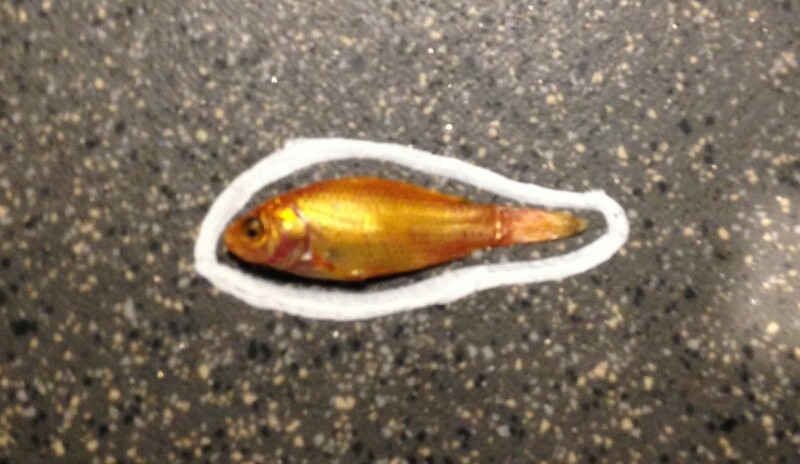 Liv’s mysterious death follows the recent loss of her roommate, Ed “Goldie” Brown who was discovered dead on the top floor of their shared bowl, days before they were both due to move house. At the time, there was no hint of foul play, but investigators are now looking at the possibility of there being a link between the two deaths. Investigators are also considering a number of potential suspects, but DCI Oliver Trout refused to reveal any names. In a statement however, he did indicate that “it is not unknown for the person who reports discovering the body to be the perpetrator of the crime”. This could be read as casting suspicion on Landlord, Nick Davis, who according to sworn statements, had previously made comments about Liv, Ed, and “two goujons and fries”, a reference to the popular item on The Plough’s menu. Our reporter, Matt Turbot, has been granted exclusive access to the scene of crime photographs and video records taken by CSI Officer Doug Salmon – readers may find some of these images disturbing. 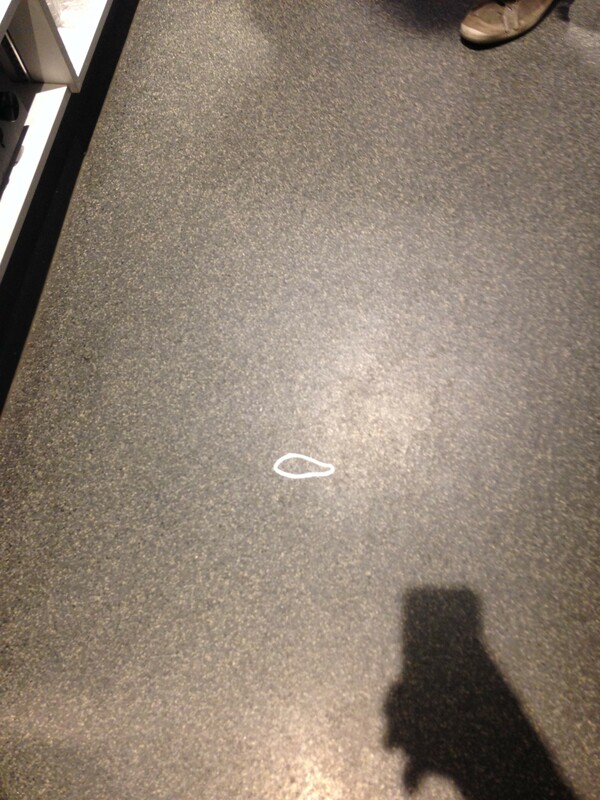 CSI Image of the crime seen showing the distance between the last known location of Liv, and where her body was discovered. CSI Image of the potential crime scene. The potential crime scene after removal of the victim’s body. Click here for Footage of CSI video sweep of the scene. Investigators are appealing for any potential witnesses, including any who may have seen Mr Davis in or around The Plough building outside of opening hours. Ms Goujon’s body is being held by forensic scientists pending toxicology test results. DCI Trout is said to be pursuing the possibility that Ms Goujon’s demise could be the result of accidental “Flying Solo” overdose, a rare form of Viognier/Grenache poisoning which is virtually undetectable. 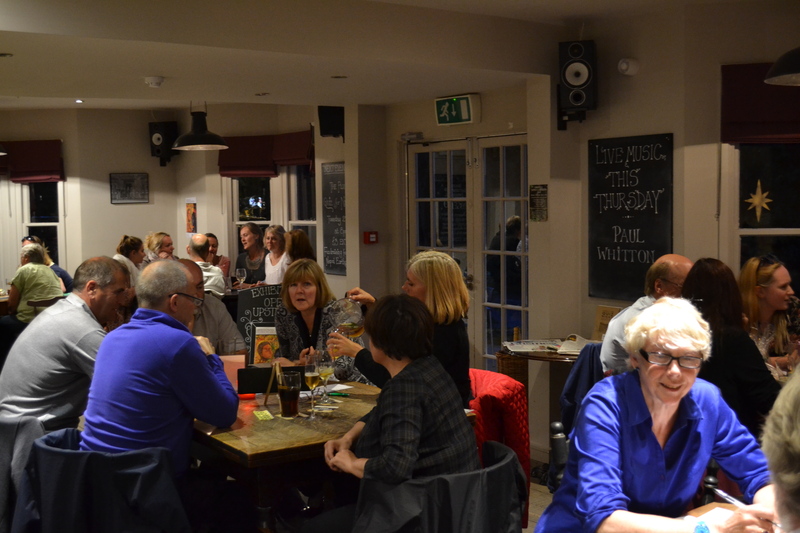 Thursday 5th March 7:30pm – Don Grusin Live at The Plough – Free Entry! 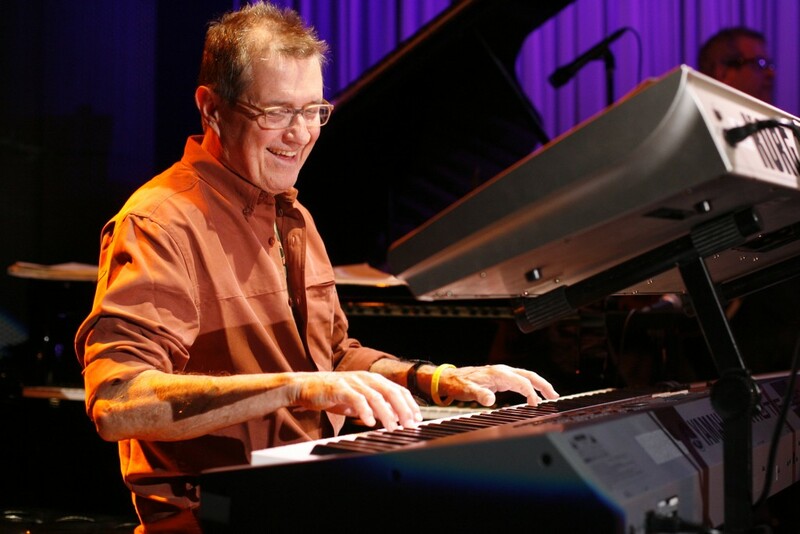 Don Grusin – Now playing Live at The Plough with a full band – Thursday 5th March 8pm – FREE! The Plough Shepreth and Ananda Recordings are honoured (and very, very excited!) to announce that the amazing Don Grusin will now be playing The Mandolin Stage at The Plough with a full band, on Thursday 5th March 2015. This free concert replaces the ticketed, solo performance previously scheduled in The Rhee Gallery. 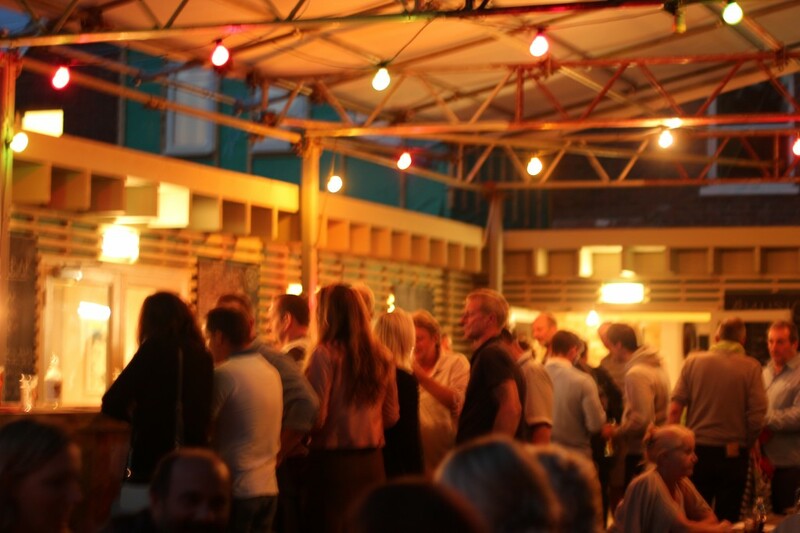 All ticket holders can gain a refund from the bar or exchange their tickets against supper or drinks. Artist, innovator, educator, performer and advocate for social change, Don Grusin, esteemed American composer, producer, arranger and pianist with 3 Grammy’s, 20 CD’s and an unstoppable global vision that infuses everything he does from recording to teaching, flys in to the UK in March. 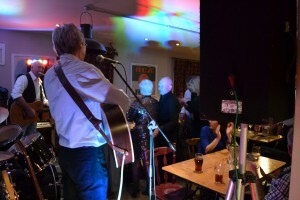 Whilst visiting from his LA home, Don will be spending time at some of his favourite recording studios and whilst over here, has agreed to a one-off performance at The Plough Shepreth. Don rarely has the opportunity to play the UK so this really is a unique opportunity to experience one of the Jazz greats in an intimate setting. Don’t miss this incredible opportunity to be enthralled and captivated by this amazing American composer and pianist who has performed and collaborated with the finest jazz musicians of his generation. Harvey Mason, Lee Ritenour, Nathan East, Gilberto Gil, Brenda Russell, Joe Pass, Phil Perry, Patti Austin, Natali Rene, Ernie Watts, Nelson Rangell, Sadao Watanabe, Charlie Bisharat, Ricardo Silveira, Frank Quintero, Abraham Laboriel, Oscar Seaton, and of course brother Don Grusin, and Bill Sharpe and Shakatak, Don has recorded and performed with them all. Check out the film of his 2004 concert “The Hang” for a taster of some of the finest Jazz you will ever experience. Tables can be booked for supper (and those by the stage are obviously going fast!) or just pitch up and treat your ears to some of the finest Jazz you will hear this year. OK Ploughsters, just a little catch up with what’s going on and what’s coming up. 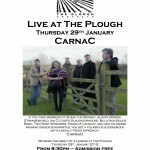 Firstly, a reminder that this week’s live music Thursday (29th January) features the debut performance of CarnaC – A fantastic new twist on Folk-Rock, here at 8:30pm. Tables for supper available and full menu from 6:00pm. Next up, an evening of Art “Talk and Walk” by artists from the STRAY Group. On Monday 2nd February at 7:30pm members of the STRAY group will be chatting about their work, influences and inspirations followed by a guided tour of their work on exhibition in the Upper Galleries. 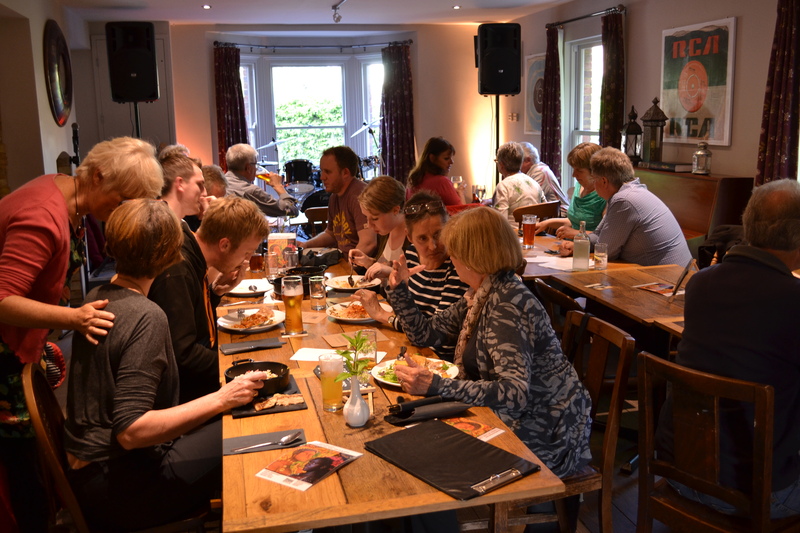 Admission is free but please call 01763 290348 to book your place in the Mandolin Bar. Don’t forget to visit the current exhibition before it finishes – there are still some works on display available to purchase. 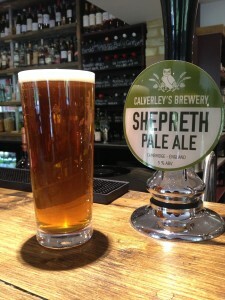 Thursday 5th February sees” Bad Sneakers” Plough debut. These guys have been champions of the local blues scene for many years, and are playing semi-unplugged versions of their catalogue from 8:30pm. As always, tables are available to book for supper. 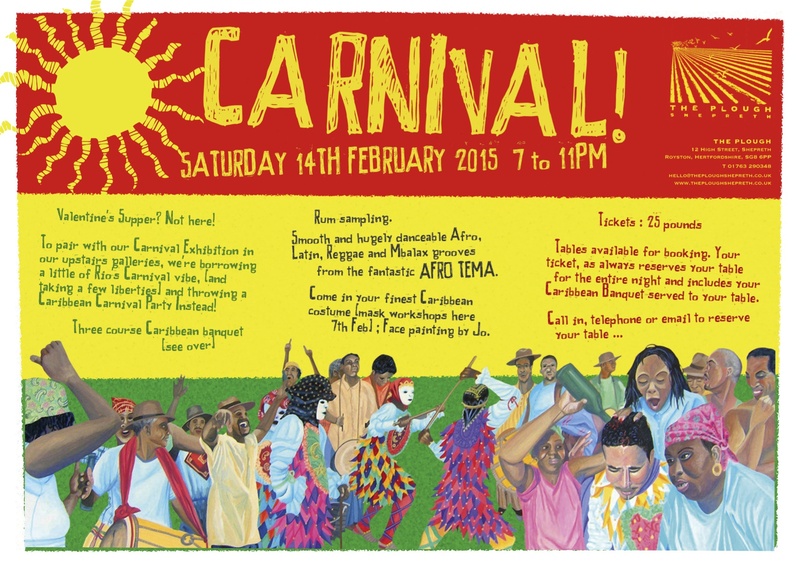 Also in February, we’re into our month-long Carnival season, with our Caribbean Art Workshops on Saturday 7th, Exhibition Preview of “Spirit Of Carnival” on Thursday 12th, and of course, our Caribbean Carnival Party on Saturday 14th February. Tickets are on sale now, and further details available here, and the menu, well, it’s here! If you would like to be amongst the first to hear of all our upcoming events, please click here to sign up to our newsletter. That’s all for now – see you soon, Nick. We’re already over a week into 2015, which makes it just over six months since The Plough re-opened! Not wanting to rest on our laurels of course, we’re well into the process of finalising our events calendar for the coming weeks and months of the New Year. That all starts tonight, with our first live music of the year: an Ananda Records showcase featuring a second Plough appearance for Neil Cowlan and Clinton Bowland, followed by debut sets from Emily Fraser and Captain. This is one of our strongest Thursday line-ups to date, and we hope as many of you as possible will be able to join us from 8.30pm in Mandolin. ‘Stray’, our inaugural show is the first in a lively programme of art related activities in The Upper Galleries. 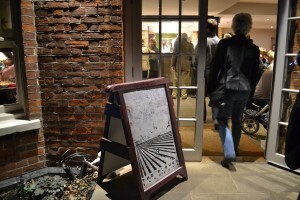 Stray itself is is a loose affiliation of professional artists who live in and around Cambridge. 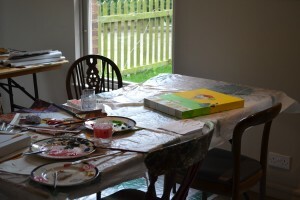 Established a couple of years ago, they work in a variety of media and disciplines, ranging from painting and drawing, sculpture and printmaking to photography, film and installation. 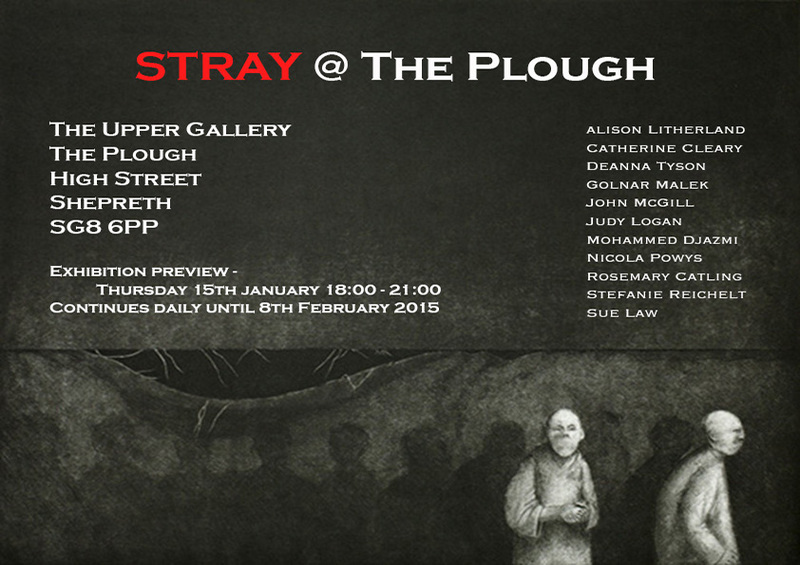 We are very excited that Stray will use The Plough as their ‘home’. 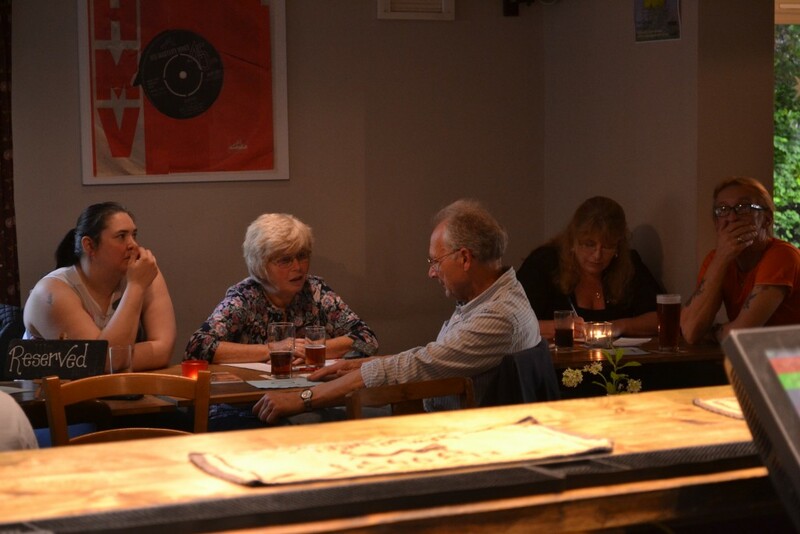 They see this as an exciting extension of their commitment to bring contemporary art to new audiences and are looking forward to contributing to the full programme of ‘Art at The Plough’ activities over the coming months, including exhibitions, workshops, talks and other art related events. 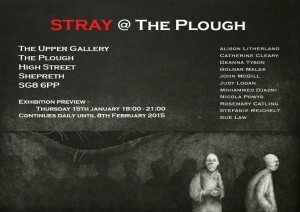 Meet the Stray artists at the Preview or at one of our Monday evening ‘Art Talk’ sessions, starting Monday 19th January. 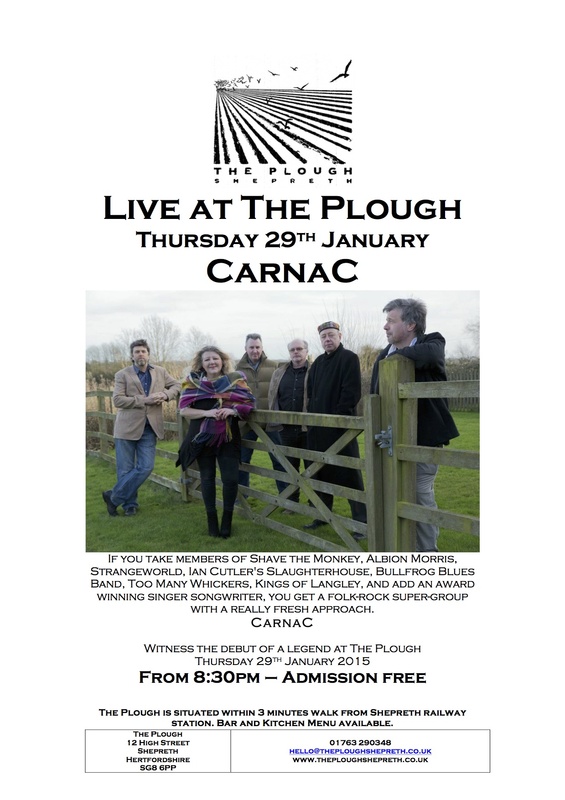 The Preview, taking place on Thursday 15th January, will also feature live music from the Hot Numbers Quartet – returning to The Plough for the second time, as well as a set from Steve Logan. We’re extremely excited to have our art and music programmes kicking off in earnest this year, and will continue to update you all on further details through our email newsletter, as well as via our Facebook, Twitter, and Google+ pages. And don’t forget that you can recycle your Christmas tree at The Plough this Saturday 10th January from 9.30-11.10am, with hot drinks available throughout as well as recycling and composting advice from local experts. 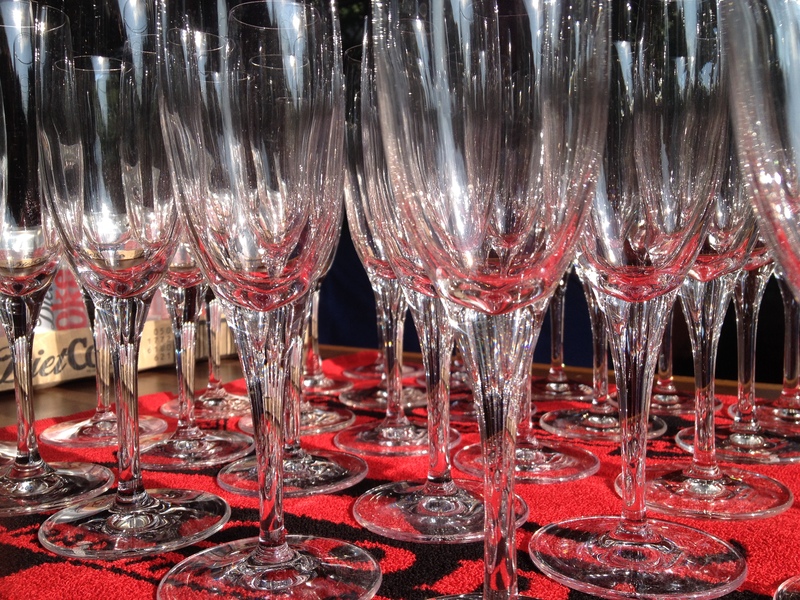 It’s almost time to wave goodbye to 2014 and drink a toast to all that 2015 will bring! Our Plough New Year’s Eve Party is now completely SOLD OUT (and we’ve just about managed to squeeze everyone onto a table). Due to capacity constraints this event is TICKET-ONLY, so please do not try to attend without one as you will be turned away. On the day we will close as usual at 3pm, and will re-open the doors at 7pm when guests begin to arrive. Food will be served to tables between 8.30-9pm, with live music beginning shortly after. We’ve also decided to lay on a New Year’s Day Recovery Breakfast from 11am-3pm for everyone who may be feeling a little delicate the next morning. £7 per head (£3.50 for under-12s) gets you a Full Plough Cooked English Breakfast including toast and fruit juice – the ideal cure for early-onset January Blues. We’ll be closing up at 5pm (and all heading home for a nap). 2014 has been an incredible first (half a) year for us at The Plough, and 2015 is shaping up to be even more exciting! A quick glance at the photos of how The Plough looked last January shows just how much can change in a year. You can expect plenty more from us in the New Year, including regular live music on Thursday evenings, a Burns Night Supper in January, a Champagne Dinner, and many more events and activities involving food, drink, art, music, and of course – you! 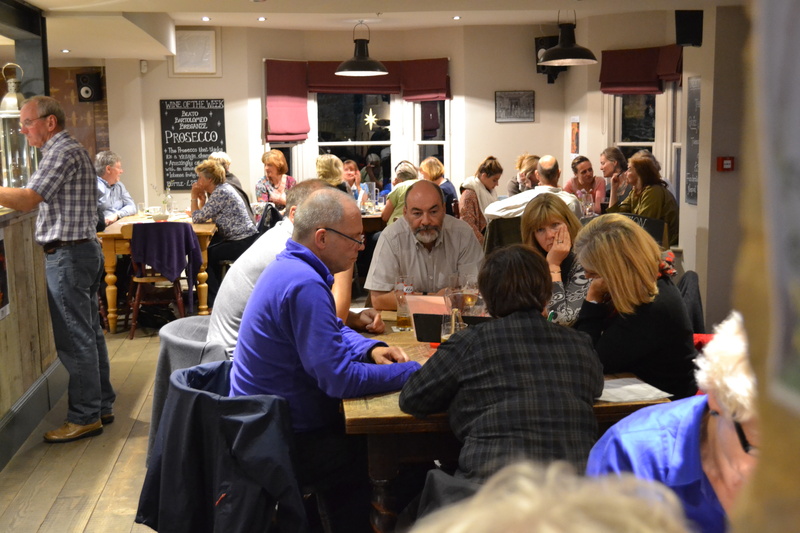 Our arts calendar for 2015 will include a variety of workshops, talks, and discussions – and will kick off with a preview of a new exhibition, ‘Stray @ The Plough’ on Thursday 15th January. Details on other up-coming events will follow shortly. We’d like to thank all of you for your continuing support throughout the past sixth months, and we’re hugely looking forward to the next twelve – starting with tomorrow night! Thanks for a great 2014 everyone! ‘As a prelude to the series of exhibitions that The Plough intends to hold in the upstairs ‘Upper Galleries’ from January 2015, we have hung the “Snow Queen – Fragments” in the smaller of the two gallery rooms. 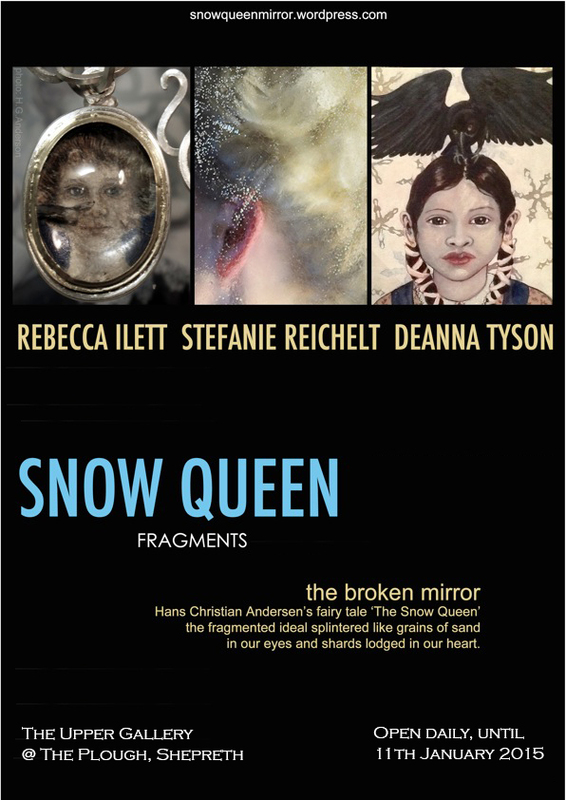 The “Snow Queen – Fragments”, a travelling exhibition, includes work by artists Rebecca Ilett and Stefanie Reichelt, plus our Artist in Residence, Deanna Tyson. 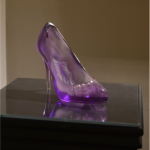 The artworks on show are a collaborative interpretation of the popular fairytale story by Hans Christian Andersen. 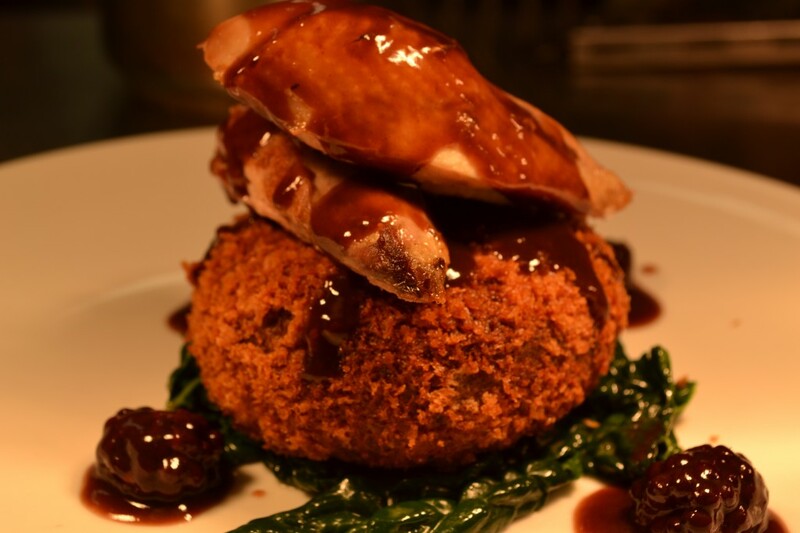 The Menu will run up until 24th December, and there’s still time to book your party in if you’ve not done so already – with booking forms and menus available via our homepage. 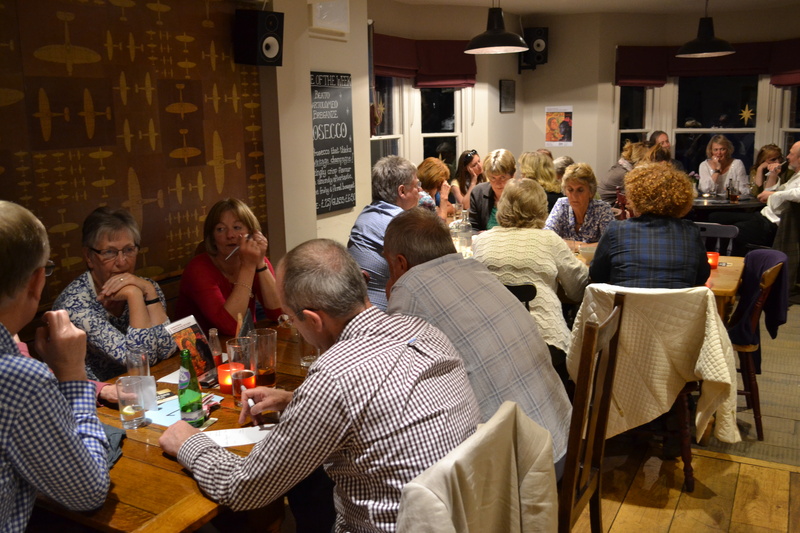 It’s also still possible to book onto tomorrow’s “Taste-the-List” wine-tasting. We’ve got over twenty wines (and a selection of cured meats and cheeses) available to try, all for just £10. 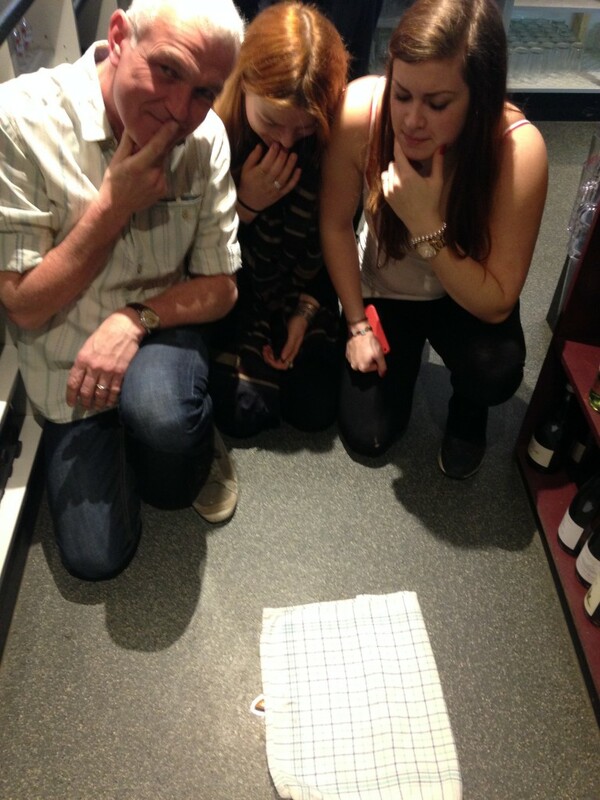 Attendees qualify for 20% of takeaway wines, whilst our wine expert will be on hand to answer questions. 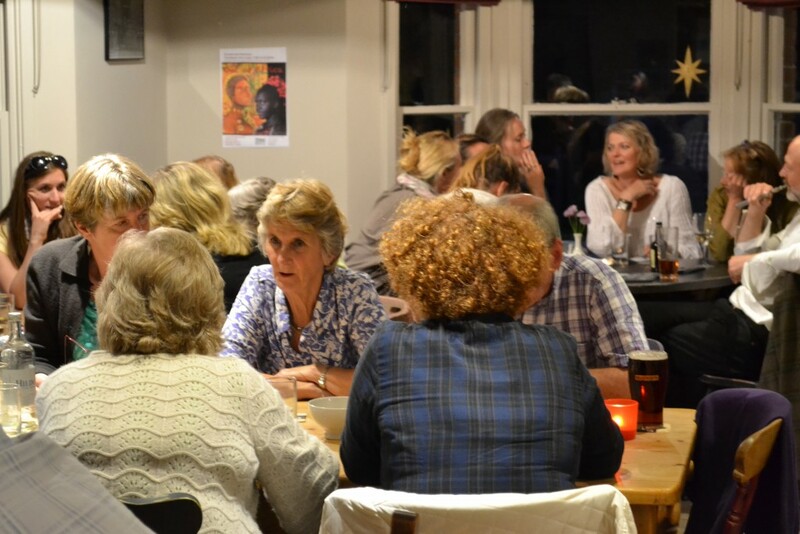 It all kicks off at 7.30pm tomorrow – book now over the bar, or give us a call! 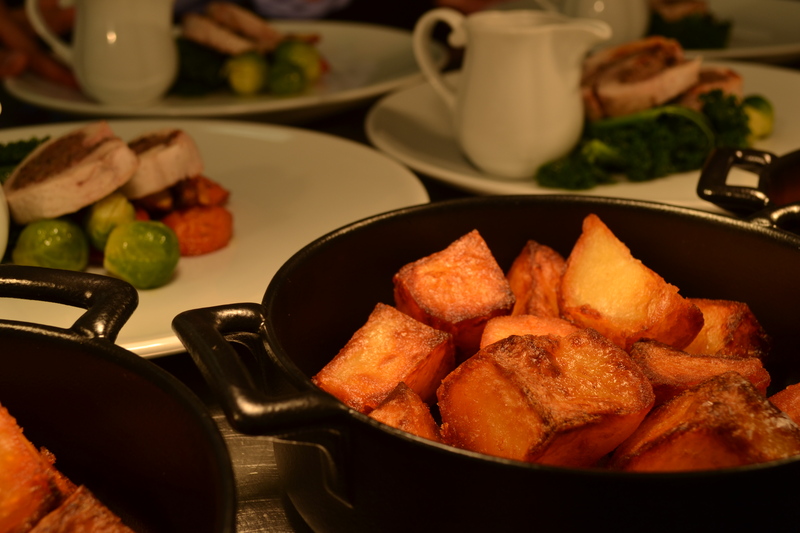 Today is the first day of December, and the Winter Events Calendar is well and truly underway at The Plough! The season kicked off on Saturday, with our Christmas Craft Fair and German Street Food Market, referred to (mainly by us) as “Kraftwerk” for short. Our newly opened upstairs rooms were taken over for the day by local stallholders selling home-made cards, decorations and gifts, whilst our (not entirely German) chefs plied fair-goers with tasty Bratwurst and warming Glühwein on the terrace. With the weather taking a decidedly chilly turn, we thought it would be wise to continue serving Glühwein – now available over the bar – for the rest of the month. 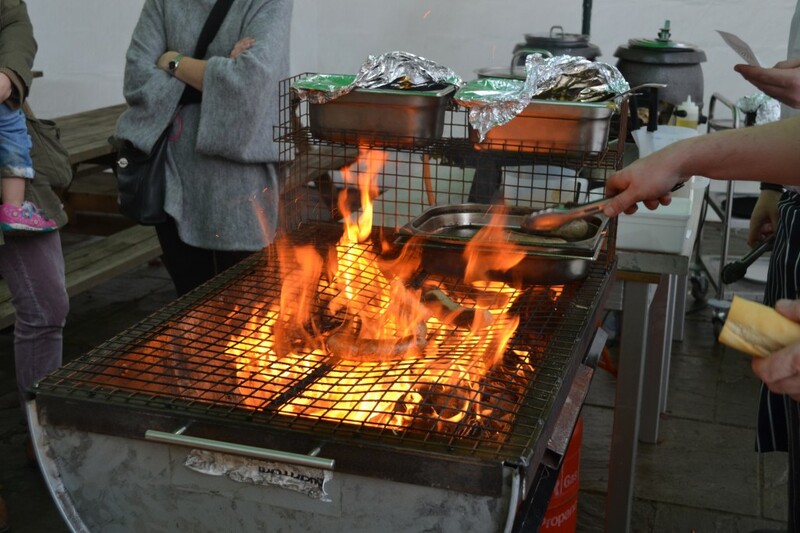 We’d like to thank everyone who came along and helped out running the stalls, and of course, all of you who came to partake! The remaining items from our own “Plough-in-a-Box” stall are now available to purchase and take home with you from the bar. 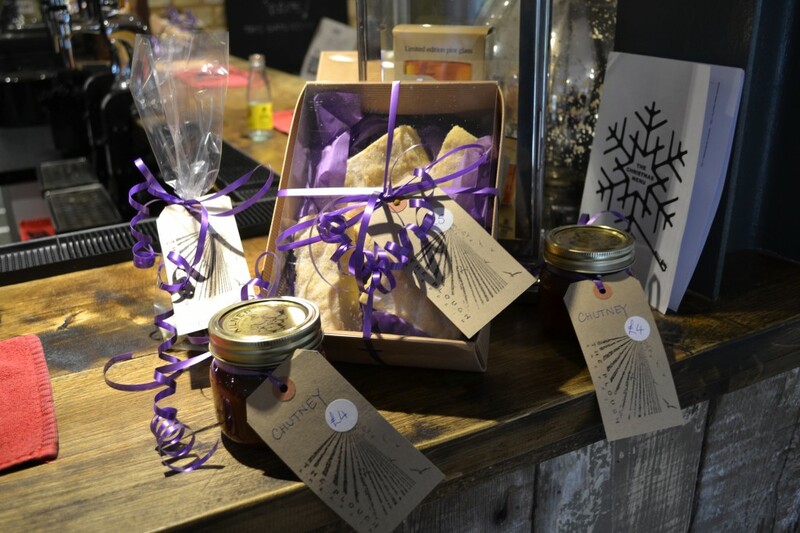 From wine boxes and bottled ales, to jars of Plough chutney and packs of luxury Plough truffles, we’ve got your Christmas shopping covered (you can view the full product list here). Next up at The Plough is an event that we’ve been meaning to bring to you for some time: a public “Taste the List” wine-tasting. Join us at 7.30pm on Tuesday 9th December, when for £10 per person you can taste every red, white, and rosé wine in our comprehensive collection alongside some complimentary cured meats and cheeses from our “Build-A-Board” menu section. 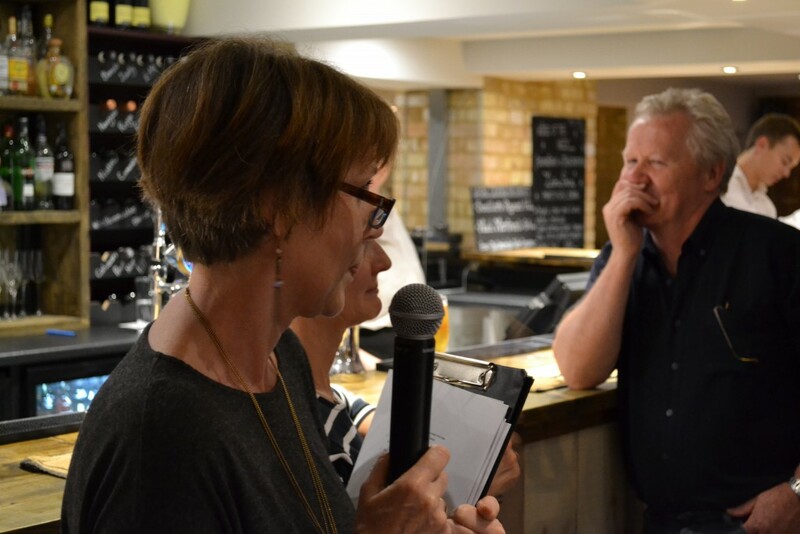 Guests will also benefit from 20% off for all takeaway wine bottles, whilst our good friend Alex from Cambridge Wine Merchants will be on hand to answer any questions relating to the wines, or indeed, life in general. Before then, we have more live music coming up this Thursday 4th December, when local group The Rain Men will be gracing our stage from 8pm onwards. 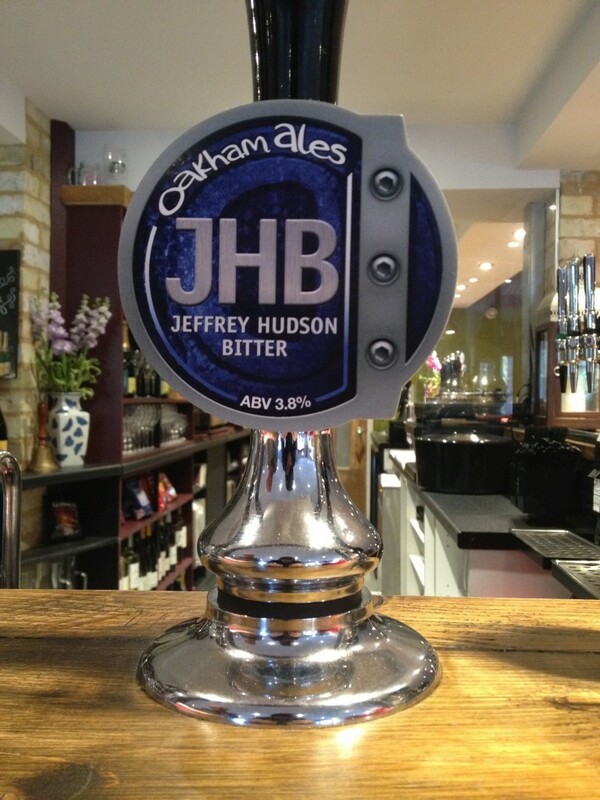 Attendees will be able to try this week’s new guest ale, which comes all the way from Peterborough: Oakham Ales’ light and hoppy bitter, JHB. On Thursday evening, we were joined in the Mandolin Bar by Alex from Cambridge Wine Merchants and Martin from Joseph Perrier UK for Champagne and ‘Palate Pleasers’, provided by our chefs. 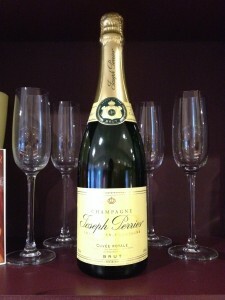 It was great to get everyone trying and talking about the wines and food – in fact, we decided we quite like champagne, so have made our house Joseph Perrier available by the glass for the rest of the week. 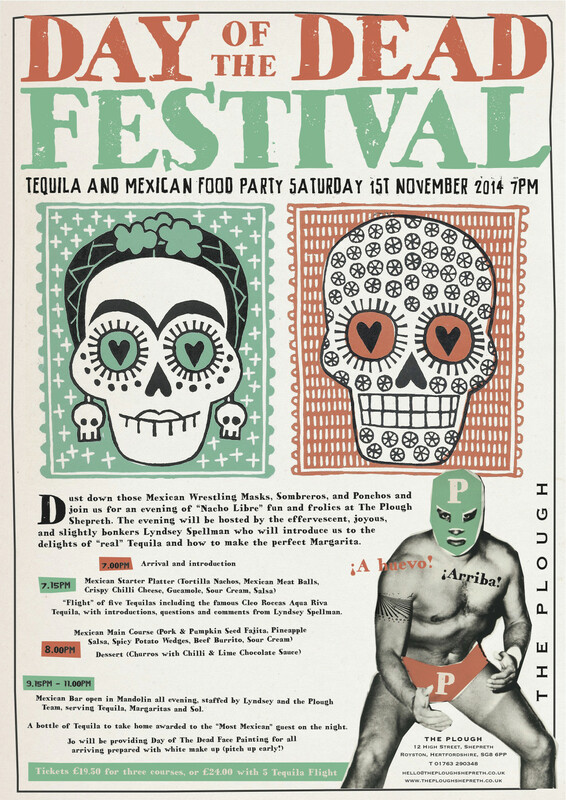 Next up is our Day of the Dead celebration on Saturday 1st November. There’s been a great uptake for both the daytime ‘Bag a Skelly’ Art Workshop and for the three-course Mexican Meal in the evening, but we will still be open as usual for anyone who hasn’t booked on to come down and share an ‘El Luchador’ Pizza and a flight of Tequila with us. After that our attention will inevitably turn towards Christmas (although it seems far too early to think about!). Our Christmas Menu is now available for you and your party to book between 1st-24th December, and can be viewed online by following this link to our Christmas brochure, which also outlines our Christmas Events Calendar. Thanks to all the brewers, bands, chefs, and of course, all of you for making the weekend so enjoyable. A photo gallery will be uploaded on this site shortly. 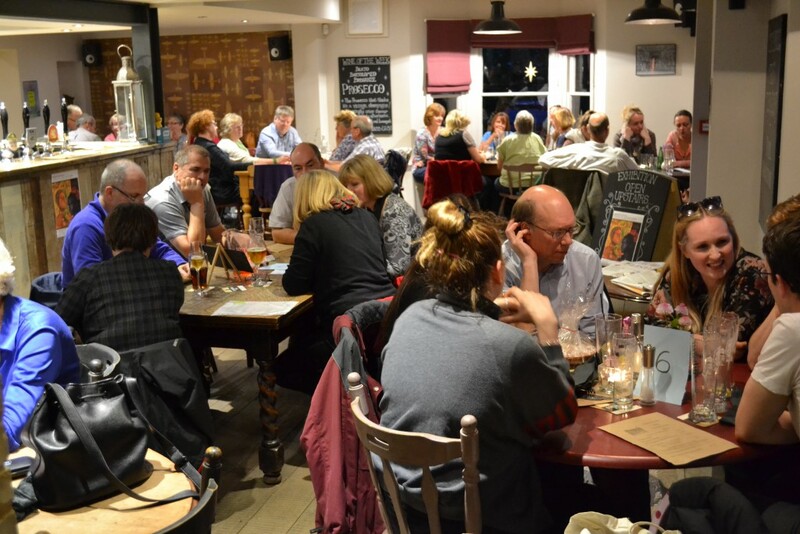 Everyone had their favourite – and their least favourite – beer, and an honourable mention for Elgood’s ‘Plum Porter’ must be made here for prowess in both those categories. It was Digfield Ales’ ‘Fool’s Nook’ that took home the crown, however, being the fastest seller of the weekend. Star Brewing Company’s ‘Comet’ ran it a close second, with Elgood’s ‘Indian Summer’ in third place. 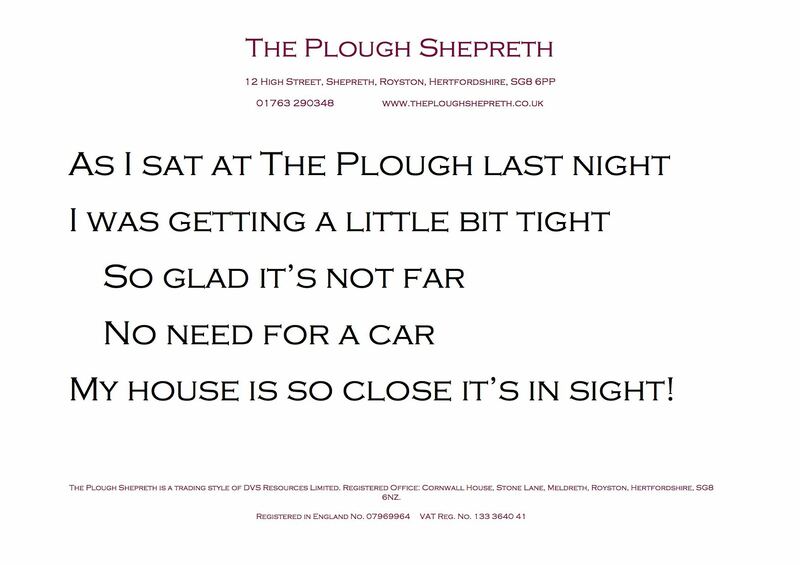 ‘When The Plough opened we handed out blank postcards and encouraged our early customers to use their creative skills and produce an artwork inspired by ‘The Plough’. We had a great response. 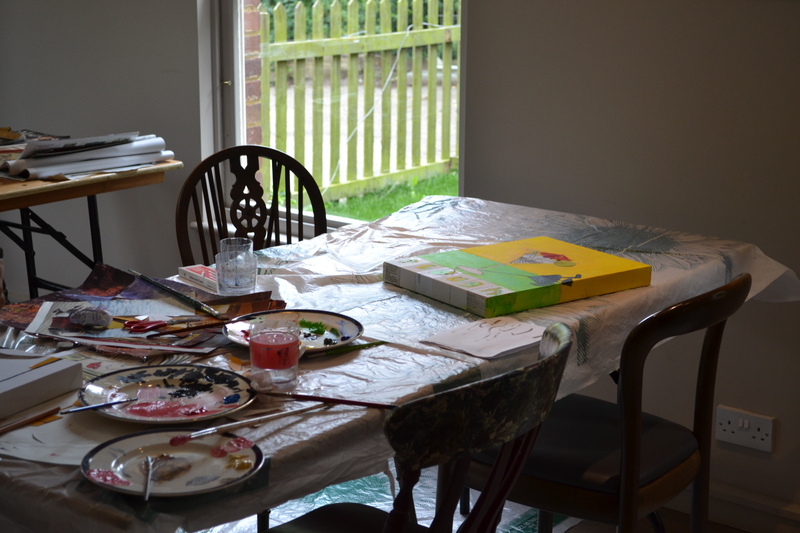 A selected group of ‘Ploughers’ then participated in a Saturday workshop to scale up their postcard-sized masterpieces. An exhibition of their collected works of postcards, canvases and boards will be on show from Saturday 27th September with a preview on Friday evening 26th September at 5:00pm. 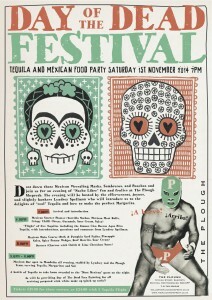 ‘Bag a Skelly for Day of the Dead’ on Saturday 1st November. Make a ‘Skelly bag’ and paper marigolds for our Plough Altar (Mexican style). 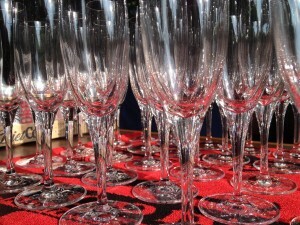 The Altar will be a focal point during a Mexican-themed evening with Tequila, Mezcal and Mexican Food. Further details of these activities, and of upcoming music events will be posted here as they are finalised, so remember to check back here regularly.